The FNB Dance Umbrella 2007 will be the 19th year that presents choreographers an open and free platform to show new contemporary works in various venues in Johannesburg. From February 17 to March 17, 2007, Johannesburg will be abuzz with exciting new dance programmes at The Wits Theatre Complex, Jorissen Street, Braamfontein; Constitution Hill, Kotze Street in Braamfontein and the new Johannesburg University UJ Arts Centre in Auckland Park. Stepping Stones 1 and 2 is on Saturday and Sunday, February 17 & 18 at the Wits Theatre from 10:00. These programmes are mainly youth and community based groups. The 3rd Stepping Stones programme will be at Uncle Tom’s in Soweto on Sunday, February 25 also from 10:00. On Friday and Saturday February 23 & 24 at 19:00, the main festival opens at The Wits Theatre with a Mixed Bill featuring Acty Tang, Thabo Rapoo and Daniel Mashita. At 20:30 in the Wits Downstairs Theatre, is Tossie van Tonder with a new work called alfabet, which is a reflection of her life and where she is today. Programme 6 on Monday and Tuesday, February 26 & 27 starts at 19:00 at the Wits Theatre. This programme is a new commissioned work from Gary Gordon entitled go. Gordon is the artistic director of First Physical Dance Theatre from Grahamstown. Programme 7 is in the Wits Downstairs Theatre on February 26 & 27 at 20:15. A collaboration between German choreographer Gerda Konig and Kenyan artist Ondiege Matthew called CounterCircles, this work features dancers who are disabled, from both Germany and Kenya. This work has been brought to South Africa with assistance from the Goethe Institute, Johannesburg. Programme 8 is Wrap Me Up a work by Swiss choreographers Katarzyna Gdaniec and Marco Cantalupo and the company Cie Linga in the Wits Theatre on February 28 and March 1 at 19:00. Wrap Me Up is about advertising and how it seduces the market. The work is presented at the FNB Dance Umbrella with assistance from Pro Helvetia: Swiss Arts Council. Programme 10 is a special Gala Evening to be held on Friday, March 2, celebrating 19 years of the FNB Dance Umbrella! Hosted by First National Bank, this one-off programme will feature selected works by Sifiso E. Kweyama, Gerard Bester, Gregory Maqoma, Musa Hlatshwayo and David April. Programme 11 is at the UJ Arts Centre on March 3 & 4 at 18:00 with a work called Encounters created by Gladys Agulhas. This work explores the various emotional and physical life journeys of people with different physical abilities. 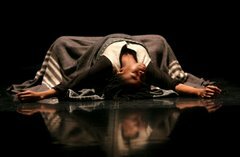 Programme 12 on March 3 & 4 @ 20:00 at the UJ Centre for the Arts will host the much acclaimed Umthombi by Durban choreographer Musa Hlatshwayo and the winner of the African Indian Ocean Choreography competition 2006 Impro-Vise_2 by Andreya Ouamba from Burkina Faso. Programme 13 is the New Moves Programme at the Wits Theatre from 14:00 on Sunday, March 4. This mixed bill features works from young up and coming choreographers, some of whom have participated in the Young Choreographers Residency programmes in the past two years. Programme 14 is at The Wits Theatre on March 5 & 6 at 19:00. French choreographer Pascal Montrouge presents his new work called Os. Programme 15 on Monday and Tuesday, March 5 & 6 at 20:00, a Mixed Bill programme at The UJ Centre for the Arts featuring Kelsey Middleton, David Matamela, Craig Morris & Roslyn Wood Morris, Belinda Nasser, Jayesperi Moopen, Bailey Snyman & Nicola Haskins, Reginald Danster and Mandla Bebeza. Programme 16 on March 7 & 8 at 19:00 @ the Wits Amphitheatre is a Mixed Bill featuring works from Deborah Hay and Deidre Wood. Programme 17, is on March 7 & 8 at 20:15 in The Wits Theatre. The programme includes Bodyscape by Moeketsi Koena and Extracts of x’s 2 by Sello Pesa. Hlengiwe Lushaba presents a new work called Lest We (I) Forget in the Wits Downstairs Theatre. 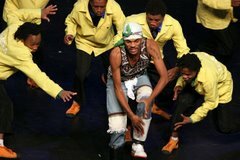 Programme 18 at The UJ Centre for the Arts on March 9 & 10 at 19:00 is a collaborative work by South African company Via Katlehong and French company Back to Hip Hop. Wola-Baba is a meeting of two cultures with backgrounds in Africa versus Europe, but which do find similarities. The work will be performed by Via Katlehong. Programme 19 also in the UJ Centre for the Arts is on March 9 & 10 at 20:30. This double bill features Blankets of Shame by Sylvia Glasser and a new collaboration called Muramba between South African artist Sifiso E. Kweyama and Zimbabwean Gilbert Douglas. Programme 20 on Sunday March 11 at 14:30 at the Wits Theatre is the 2nd New Moves programme which will again feature a variety of artists from all over South Africa. Programme 21 on Monday and Tuesday, March 12 & 13 at 20:00 takes place at the UJ Centre for the Arts. Inside of me another Island is a creation from Mozambique based artist Panaibra Gabriel. This work talks about the “I’ and the other; between man and the actual being. This work won the 3rd prize in the African Indian Ocean Choreography Competition 2006. Programme 22 is on Wednesday and Thursday, March 14 & 15 at the UJ Centre for the Arts from 20:00. Gregory Maqoma completes his Beautiful trilogy with Beautiful Me, a work inspired by Akram Khan, Faustin Linyekula and Vincent Mantsoe, choreographers he has collaborated with to create the piece. Programme 23 on Friday and Saturday, March 16 & 17, takes place at Constitution Hill from 18:30 and again at 20:00. Jampass is choreographed by Ina Wiechterich for the Cape Town-based Remix Dance Theatre. Programme 24 takes place in the Wits Downstairs Theatre also on March 16 & 17 at 19:15. This is a triple bill featuring Timothy Le Roux, Sifiso Majola and Aja Marnewick. The final Programme 25 is at 20:30 at the Wits Theatre on March 16 & 17 with works from Constance Kau, Mdu Mtshali who both received the Phillip Stein Grant and Mlu Zondi from Durban. 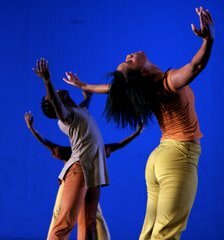 Other highlights for FNB Dance Umbrella 2007 are The Gauteng MEC Awards for Contemporary Choreography and Dance 2006, which will be presented on Saturday, March 17, at the Wits Amphitheatre before the final performances. The FNB Dance Umbrella 2007 will also include a Young Choreographers Residency Programme which has been funded by the National Lottery Distribution Trust Fund and the National Arts Council. This will take place from February 27 to March 11, 2007. The FNB Dance Umbrella 2007 has been made possible with assistance from First National Bank; National Lottery Distribution Trust Fund; The French Institute of South Africa; French Cultural Centre Mozambique; CulturesFrance; Business and Arts South Africa; the National Arts Council; Pro-Helvetia Swiss Arts Council; The Goethe Institute of Johannesburg and the Gauteng Department of Sport, Recreation, Arts & Culture. Tickets for the FNB Dance Umbrella are available at the door or can be booked at Computicket on 011 340 8000 and prices range from R20,00 to R80,00. Concessions/block bookings and subscription tickets are available.